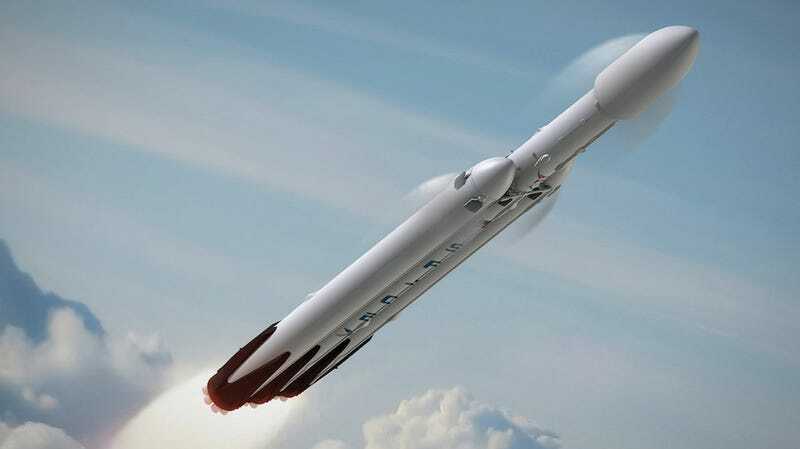 Well, here’s a bit of space news we weren’t expecting: Today, future Martian overlord and SpaceX founder Elon Musk announced that in 2018, the company intends to fly two private citizens around the Moon in its Dragon 2 spacecraft, carried to orbit by its extremely powerful, not-yet-tested Falcon Heavy rocket. While the voyagers’ names have not been disclosed, according to SpaceX, a “significant deposit” has already been made. According to Musk, the trip will last approximately one week. The passengers will travel beyond the Moon and loop back to Earth, covering a distance of 300,000 to 400,000 miles. While the passengers will undergo some sort of training beforehand, it’s unclear if the two have any experience with piloting, nevermind spaceflight. The mission, although unrelated to NASA’s plan to slingshot astronauts around the Moon in several years’ time using the SLS rocket and the Orion capsule, was made possible in part by funding SpaceX has received to develop its human spaceflight technology through NASA’s commercial crew program. SpaceX is planning to fly an uncrewed Dragon 2 to the ISS by the end of the year. In 2018, the company intends to send its first crewed Dragon 2 the ISS, followed by this newly-announced trip around the moon. It’s worth noting, however, that SpaceX’s timeline for crewed missions has already slipped—initially, the company planned to begin sending astronauts to the ISS in 2017. Elon Musk is notorious for not quite meeting his ambitious, often self-imposed deadlines. Money can’t buy you happiness, but apparently, it can buy you one sweet vacation?